Thought about booking a Wisconsin Dells holiday package? It's simple with Expedia, and you'll be able to buy a few nice meals or gifts for your friends back home with the cash you save. Savvy travellers who secure a package deal on Expedia can save as much as 59%*. Our comprehensive database allows you to research more than 321,000 properties worldwide and 400 partner airlines. With such a terrific range of options, arranging your dream holiday will be a breeze! You don't have to worry about altering your family's holiday plans, as we don't charge additional cancellation fees for almost all of our hotel bookings. Preparing for your trip to Wisconsin Dells? Like some tips about what to do and see when you arrive? That's where we can help! Remember to pack your swimsuit! No matter if you love adrenaline-charged rides, chilling down lazy rivers or relaxing in paddling pools, Chula Vista Waterpark is a wonderful day out for everybody. Visitors in this destination have a great range of options. Attempt to score that difficult hole-in-one or simply enjoy a few laughs at Pirate's Cove Adventure Golf. A fun day out for the whole family, the only thing left to do is grab a putter and try out your skills! Still got time on your hands? If amusement parks are one of your favourite things, look no further! Whether you're an adventure addict or you're more laid-back, Wizard Quest has the perfect ride for you. Make your way to Wisconsin Dells with ease knowing that you've got your accommodations sorted out. With at least 55 properties to pick from, booking a soft, comfy bed for your next cheap holiday or luxury getaway won't be difficult! Start your holiday on a fancy note by sliding between the silky sheets at the Condos at 530 E. Hiawatha (530 East Hiawatha Drive). Alternatively, the Delton Oaks Resort (730 East Hiawatha Drive) is an excellent place for the thrifty traveller to spend their evenings. There's nothing as satisfying as hitting the tarmac at Dane County Regional Airport (MSN) after a cramped flight. After you've grabbed your suitcases and stretched your limbs, you'll find yourself just 40 miles (64 km) from the centre of Wisconsin Dells. 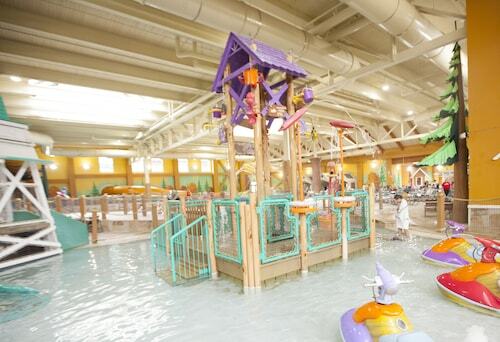 This family-friendly Wisconsin Dells resort is within 1 mi (2 km) of Paul Bunyan's Northwoods Lumberjack Show, Beaver Creek Springs Aquarium and Vertical Illusions. Noah's Ark Waterpark and Top Secret are also within 3 miles (5 km). 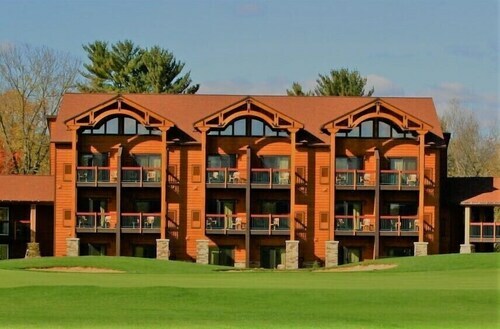 This family-friendly Baraboo resort is located near the airport, within 3 mi (5 km) of International Crane Foundation and Wisconsin Dells Wisconsin Opry. Noah's Ark Waterpark and Knuckleheads Bowling and Family Entertainment Center are also within 6 miles (10 km). This family-friendly property is located in Baraboo, close to Knuckleheads Bowling and Family Entertainment Center, Outlets at The Dells and Canyon Creek Riding Stables. Also nearby are Wisconsin Dells Wisconsin Opry and Palace Theater. 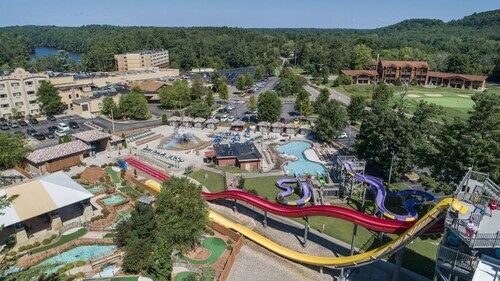 Located on the riverfront, this family-friendly resort is within 9 mi (15 km) of Top Secret, Noah's Ark Waterpark and Crystal Grand Music Theater. Palace Theater and Outlets at The Dells are also within 9 mi (15 km). Located in the heart of Wisconsin Dells, this hotel is within a 10-minute walk of Riverwalk, Wizard Quest and Ripley's Believe It or Not. Top Secret and Noah's Ark Waterpark are also within 3 mi (5 km). Wisconsin Dells Station is 10 minutes by foot. 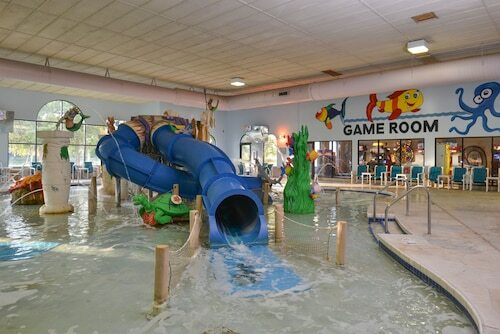 Situated in Wisconsin Dells, this resort is within 1 mi (2 km) of Big Chief Go Karts and Noah's Ark Waterpark. Top Secret is 1.9 mi (3 km) away. Situated in Wisconsin Dells, this hotel is 0.6 mi (0.9 km) from Paul Bunyan's Northwoods Lumberjack Show and within 3 miles (5 km) of Noah's Ark Waterpark and Top Secret. Beaver Creek Springs Aquarium and Trappers Turn Golf Course are also within 15 minutes. Wisconsin Dells Station is 25 minutes by foot. This family-friendly Wisconsin Dells hotel is located on the Strip, within a 5-minute walk of Timbavati Wildlife Park and Noah's Ark Waterpark. Top Secret and Timber Falls Adventure Park are also within 2 mi (3 km).